For Sale: 695 S. Alder St.
Quick possession available on South Alder Street in Campbell River! This +2900 Sq. Ft. home is empty and ready for you to move in! Tonnes of space for the whole family including an in-law suite. A total of 4 bedrooms and 3 bathrooms, forced air natural gas heating and brick accents. A great home to make your own. By now you may have heard of the new Real Estate consumer protection rules coming to BC which take effect June 15, 2018. While the goals of the rules are to protect you, the consumer; ensure you are well-informed and can benefit from the loyalty of us, your agents acting in your best interests, they are hindering our ability to work with you again and again. Although we feel that the disclosures are here to help you make the most well-informed decisions surrounding complex issues, prohibiting dual agency is going to affect our relationships with you, whom we have grown to love working with! You can also head on over to a petition on Change.org here. The goal here is to inform and provide our government leaders with the information they need to make more balanced public policy decisions by listening to the concerns and points of view from a wide variety of stakeholders. The problem with prohibiting dual agency is that agency survives a deal – if we’ve worked with you, we have agency. If Shoreline helped you buy or sell a house in the past and you want to sell again, that’s great, we will help you list it! But, we have to hope that none of the buyers we are currently working with want to write an offer on your property because we will then have to refer them to another Realtor, one who also has no agency with that particular buyer. In a city the size of Campbell River, that will be hard to find. The bigger problem is that we will then also have to refer you, the Seller to another Realtor, dual recusal, because we can’t work for the Seller having worked with that buyer previously, despite the fact that they’re writing their offer with another Realtor. Confused yet? The worst part? You are now having to work with someone who likely doesn’t know the property, has no rapport or trust built. Imagine having to get an out of town Realtor to write your offer? Us neither. So please jump on the links above and help us adjust the rules around dual agency. All we can do is work with the rules as best we can while still providing you the service you have come to know and love. We will still help you as we always did with everything real estate. We will stay well informed and keep you up to date as we work with the new rules. For Sale: 306 – 3120 Island Hwy. Own your own lot with the purchase of this rare ‘no pad fee’ mobile for sale in Forest Glen on the Island Highway in Campbell River. This 2 bedroom, 1 bathroom mobile with addition includes two storage sheds on a good sized lot. Low strata fees and you own the 4792 sq. ft. lot! 306 – 3120 Island Hwy. B.C. 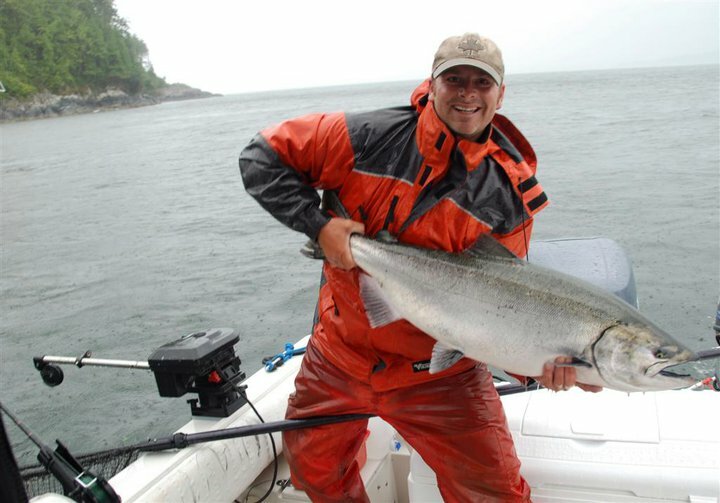 Fishing Charters is run by Bryan, born and raised right here in beautiful Campbell River. Bryan has been fishing the waters near Campbell River since he was old enough to walk and has been working as a fishing guide for over 25 years. Bryan recently upgraded his boat which is located in discovery harbour and ready to explore out of Campbell River, Nootka Sound, and Gold River. Bryan’s boat is a very comfortable 24 foot Grady White Gulfstream with twin 150HP 4stroke engines that make for a quiet and clean ride. The boat is fully loaded with radar, sounder/gps, VHF and all required safety gear. It comfortably seats 2-4 guests and is fully equipped with gear, life jackets and even a toilet! A covered seating area provides shade and rain cover for enjoying in any weather. All fishing gear and tackle is included, but if you have a lucky rod & reel you are welcome to bring it along, just don’t forget your license. In the off season Bryan has worked at the local Quinsam Salmon Hatchery since he was 18 years old. This is where he finds his work most fulfilling as he gets to raise and release millions of wild salmon back into our waters. Bryan just so happens to be available June 9 if you’re looking to get a group of friends together and hire a guide…but don’t wait too long..he may have already booked up while you sat here reading about him…. Curious about the real estate market these days? Well, here is a little snap shot as of May 1, 2018 for Campbell River. During the month of April, 2018, 58 homes total were listed with 44 of them selling, making the average for days on market 20 days. Of those listings, Campbell River saw an average of 116% list to sell price ratio, which means many homes sold for over list price!! The average home sale price in Campbell River now sits at a cool $417,000.00! Extremely low inventory combined with Spring market conditions that have always brought out the buyers, has us in an intense sellers market right now. We seem to keep repeating ourselves, but we can’t help it, now is a great time to sell if you’ve been toying with the idea. Questions about buying or selling in this market? Call us, we are always here to help and happy to answer any questions you may have. For Sale: 1876 Galerno Rd. Fun, cozy and filled with charm! 1900+ sq.ft rancher in the Cottonwood subdivision area, we can truly use the term “rare find’ with this listing! Amazing living and family rooms separated by french doors full of charm and style, with a cozy wood stove and classic cedar ceilings restored to their natural beauty. This home scores big when it comes to interior design, with the perfect mix of classy warm wood finishing and vaulted ceilings, rustic wood floors and trendy modern touches throughout. Large master bedroom with built in drift wood headboard and shelves, full ensuite, walk in closet and doors out to the private and newly landscaped back yard. Exterior updates in recent years include, roof, garage doors, paint, new wood shed and fencing. Lots of parking with an extra large double garage and a level driveway. Prime location just a couple blocks in one direction to the Sportsplex field, trails, frisbee golf and tennis courts and a couple blocks in the other direction to the ocean and sea walk. Serious Coffee may not be new to you or Campbell River per se, but the owner, manager and interior will be! Nicole Rae Husby is the proud new owner of Serious Coffee at #1-2253 South Island Highway in Willow Point . With her new business endeavour she is making some serious (see what we did there?) changes to the location. Husby took possession of the Willow Point cafe on April 19, 2018 and is planning to celebrate the reopening of Serious Coffee and unveil the major renovations currently underway on May 19th with a grand opening. 2day FM will be at the location for the grand opening from 2pm-6pm. There will also be live music, draws, prizes and of course, great coffee and food! One of the reasons Husby says she chose a Serious Coffee franchise (besides the great coffee) “was because of the authenticity and community spirit. [We] want to make our Willow point location a hub for locals and are open to facilitating more local clubs/groups and people’s ideas for new events.” The “we” she may be referring to is her long time best friend, Christie Keddy. Keddy and Husby have known each other their whole lives and have been best friends for years. Keddy will be the cafe’s manager, managing and running the front of house. She is definitely a big part of the business. The renovations don’t just end there, the drive through is getting a bit of a makeover as well; It’s great if you’re in a hurry and need to have your coffee and breakfast or lunch on the go! Staff will be serving new menu items and will really focus on consistency, community and excellent coffee, food and service. Serious Coffee has a liquor license and will be offering up great beers and wine too. They will be hosting different events throughout the months. Some examples are plans for more live music nights, children’s tea parties, wine and paint nights, flower arranging with signature martinis, games nights, etc. The website includes an events tab that will be updated as new events are added. Like the Shoreline team, charity is near and dear to Husby’s heart and she will be donating a portion of the money made during the grand opening on May 19th to a local charity and has committed to continue to donate locally throughout the year. Nicole Husby and Shoreline are excited for the changes! We can’t wait to check them out and see you there on May 19th! For Sale: 702 Thulin St.
1000 sq. ft. 2 bedroom, super cute and bright home on a big, ocean view lot. Centrally located on a super quiet street, this .21 acre lot has wonderful ocean and mountain views. A quaint and cozy place to call home or a super holding property to someday build on, the potential views from a second storey would be amazing here! Don’t wait on this one, these properties in this neighbourhood are sought after!